Duck Active Jac - Quilt-Flannel Lined J140 12-ounce, firm-hand, 100% ring-spun cotton duck with plied yarns for added durability. Water-repellent (re-treat after washing). Brushed polyester lining quilted to polyester insulation. Nylon lining quilted to polyester insulation in the sleeves. 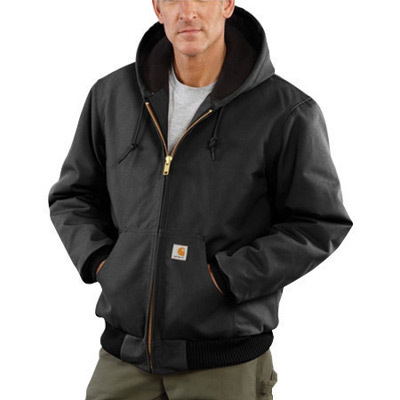 Attached quilted-flannel-lined three-piece hood with adjustable tipped drawcord. Zipper front. Front hand-warmer pockets. Inside welt pocket with zipper closure on right side for secure storage. Inside patch pocket with hook and loop closure on left side for added convenience. Rib-knit cuffs and bottom band. Work fit for better range of motion and comfort. Hanger loop. Radnor� lab coats provide light splash and dry particulate protection. Lab coats provide light weight protection and are more breathable than coveralls. Radnor� Spunbond Polypropylene Lab Coats are made from soft, breathable 100% polyproplene material. This material is resistant to rot and mildew, doesn't support bacterial growth, is non-allergenic and non linting. This material will not flare, but will melt if exposed to open flame or high temperature substances. 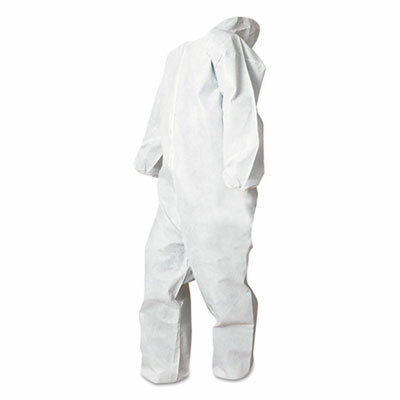 Radnor� polypropylene coveralls are a cost effective dry particulate barrier. Collar, two pockets and a snap front closure. Non-linting material. Resists mildew and bacteria and is non-allergenic. Doesn't support bacterial growth Non-Allergenic Breathable and lightweight. Will melt if exposed to open flame or high temperature subastances. This item cannot be shipped to APO/FPO addresses. 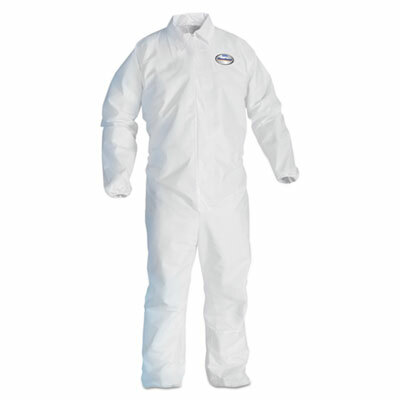 DuPont� Tyvek� Series 122S Coveralls have a zipper front closure, skid resistant boots and attached hood. Elastic around hood & wrists with set sleeve pattern for greater arm movement and serged seams. Introducing Tyvek� with the new comfort fit design. Professionals told us what they want in a protective garment. And they all agree, garments should fit better and not limit job performance. 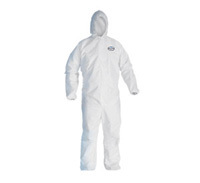 That's why DuPont developed its Tyvek� garment with the new comfort fit design. Tyvek� garments provide the best balance of protection, durability and comfort and the new comfort fit design provides added benefits such as greater range of movement, improved mobility with more room in the back and reinforcement in high stress areas for fewer blowouts. Tyvek� is the industry standard for inexpensive, particulate resistant, disposable clothing. Made from durable spunbonded olefin to resist most hazardous dusts and provide light splash protection. Will remain effective wet or dry. Excellent for spray painting, sand blasting, asbestos removal or anywhere there is dust or dirt. Greater range of movement while stretching and bending Improved mobility with more room throughout the back More tailored fit and better overall comfort An inherent barrier - not a laminate that can be easily scratched or compromised Lightweight, low-linting and anti-static Skid Resistant Soles Agriculture Food Processing Medical Applications for use as modesty garments Fiberglass Manufacturing Spray Painting / Finishing Operations Lead Abatement Asbestos Abatement Mold Remediation Applications involving dry chemicals, dirt and radioactive dust This item cannot be shipped to APO/FPO addresses. KLEENGUARD* A40 liquiduid & Particle Protection Apparel Coveralls have a zipper front and are low in lint. They pass NFPA 99 criteria for antistatic materials. White. Size large. This item cannot be shipped to APO/FPO addresses. Chemical plants Chemical processing Oil refining Petrochemicals Bulk chemical handling and transport Handling specialty chemicals This item cannot be shipped to APO/FPO addresses. 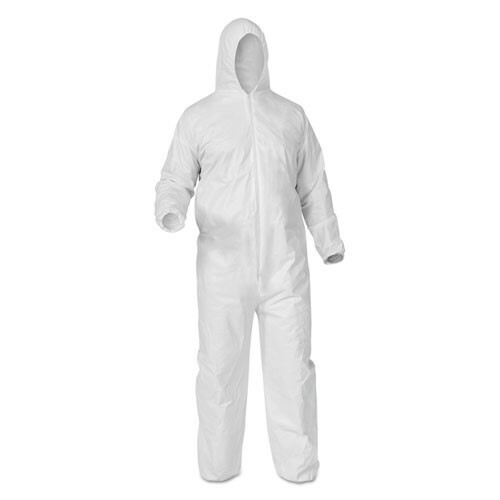 DuPont� Tyvek� Series 127S Coveralls have a zipper front closure, attached hood with elastic around the face, wrists and ankles. Serged seams for strength and set sleeve pattern for greater arm movement. 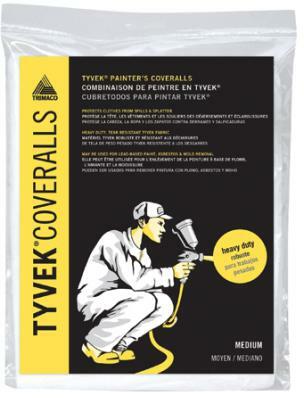 Introducing Tyvek� with the new comfort fit design. Professionals told us what they want in a protective garment. And they all agree, garments should fit better and not limit job performance. 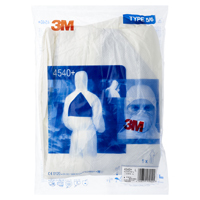 That's why DuPont developed its Tyvek� garment with the new comfort fit design. Tyvek� garments provide the best balance of protection, durability and comfort and the new comfort fit design provides added benefits such as greater range of movement, improved mobility with more room in the back and reinforcement in high stress areas for fewer blowouts. Tyvek� is the industry standard for inexpensive, particulate resistant, disposable clothing. Made from durable spunbonded olefin to resist most hazardous dusts and provide light splash protection. Will remain effective wet or dry. Excellent for spray painting, sand blasting, asbestos removal or anywhere there is dust or dirt. Greater range of movement while stretching and bending Improved mobility with more room throughout the back More tailored fit and better overall comfort An inherent barrier - not a laminate that can be easily scratched or compromised Lightweight, low-linting and anti-static Agriculture Food Processing Medical Applications for use as modesty garments Fiberglass Manufacturing Spray Painting / Finishing Operations Lead Abatement Asbestos Abatement Mold Remediation Applications involving dry chemicals, dirt and radioactive dust This item cannot be shipped to APO/FPO addresses. While not primary fire protection gear, KLEENGUARD* A65 Coveralls are designed to be worn in areas where exposure to sparks is possible. 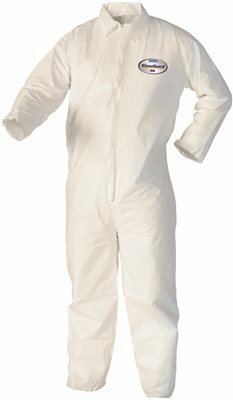 Kimberly-Clark* KleenGuard* A40 Liquid & Particle Protection Coveralls are made from a breathable, microporous film laminate, KleenGuard* A40 Coveralls are an excellent replacement for Tyvek�. Breathable, microporous film laminate allows sweat and moisture vapor to escape Better liquid and particulate barrier than TYVEK� Lower in lint than TYVEK� Maintenance & General Clean Up Liquid Handling Manufacturing & Assembly Utilities Asbestos & Lead Abatement Food Processing Aerospace Liquid Handling Food Processing Aerospace Compliant NFPA 99 antistatic material Meets ANSI / ISEA 101 � 1996 sizing standard Passes ASTM F1670 testing for penetration of blood and body fluids This item cannot be shipped to APO/FPO addresses. 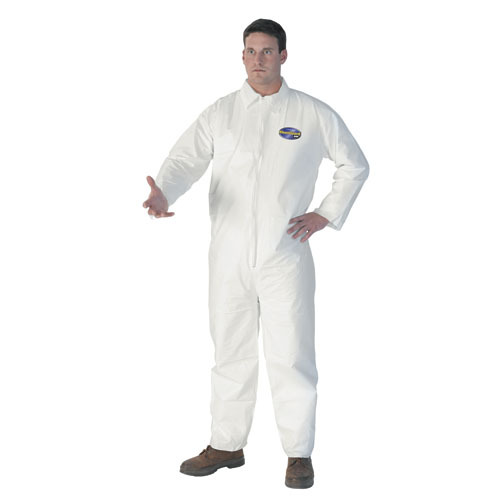 DuPont� ProShield� NexGen� Series 122S Coveralls have a front zipper closure and an attached hood and boots. There is elastic at the hood, wrists and ankles. Set sleeve design allows greater arm movement. Based on patented microporous fabric technology, NexGen� greatly improves worker protection while dramatically reducing the price. All this in a new, high-tech fabric that offers cloth-like comfort that is easy to wear. NexGen� offers excellent protection against a wide range of hazards and nuisances. Ideal wherever general protective clothing is worn, this new fabric is especially suited for non-toxic liquid and spray hazards. It provides true aerosol and liquid-proof barrier, and gives greater than 99% holdout of particles down to 0.35 microns. Durable and comfortable, NexGen� holds up to the day-to-day demands of most common industrial applications. ProShield� NexGen� is an effective barrier against a variety of common industrial aerosols and liquids. Based on patented microporous technology, NexGen is a cloth-like fabric that is easy to wear. Provides true aerosol and liquid-proof barrier, with greater than 99% holdout of particles down to 0.35 microns. Agricultural chemical mixing and applications, chemical processing and handling. This item cannot be shipped to APO/FPO addresses. Lightweight for added comfort. Hooded -zipper front, elastic wrists & ankles. Typical uses include liquid handling, pressure washing, maintenance, and general manufacturing. Features: Breathable, liquid and particulate barrier, micro porous film laminate, and ANSI/ISEA 101-1996 sizing standard. Size X-Large. 25/case. Disposable haircaps are a comfortable and complete head covering. 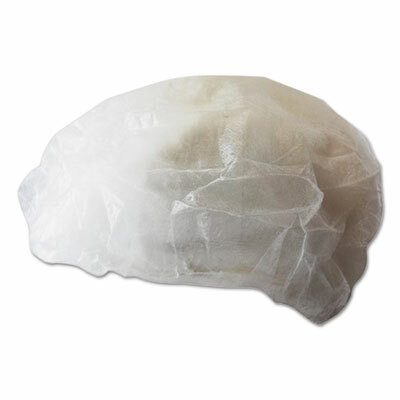 Made of a solid, soft, non-woven, lint-free fabric, the non-pleated hair cap with elastic is excellent for use in food plants, labs and pharmaceutical applications. Elastic band for secure fit. Apparel Type: Headwear; Material(s): Polypropylene; Color(s): White; Size Group: X-Large. 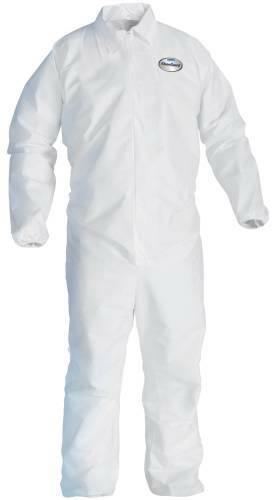 KLEENGUARD* A40 liquiduid & Particle Protection Apparel Coveralls have a zipper front and are low in lint. They pass NFPA 99 criteria for antistatic materials. White. Size X-large. Lightweight for added comfort. Hooded -zipper front, elastic wrists & ankles. Typical uses include liquid handling, pressure washing, maintenance, and general manufacturing. Features: Breathable, liquid and particulate barrier, micro porous film laminate, and ANSI/ISEA 101-1996 sizing standard. Size 2X-Large. 25/case. Disposable beard�covers completely cover beards, mustaches, and sideburns, making them great for food handling.�Covers are made with soft, non-woven polypropylene for user comfort. They are lightweight and cool for easy wear. Secure fit, with an elastic strap around the back of the head for comfortable wear. 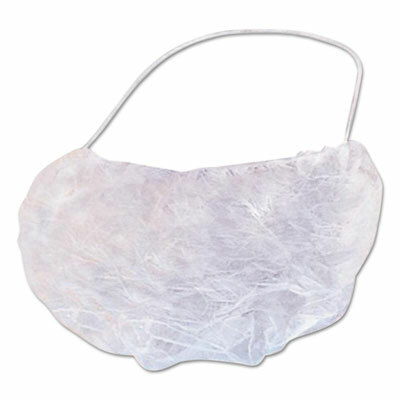 Apparel Type: Beard Net; Material(s): Polypropylene; Color(s): White; Size Group: Regular Size. KLEENGUARD* A40 liquiduid & Particle Protection Apparel Coveralls have a zipper front and are low in lint. They pass NFPA 99 criteria for antistatic materials. White. Size 3X. Lightweight for added comfort. Hooded -zipper front, elastic wrists & ankles. Typical uses include liquid handling, pressure washing, maintenance, and general manufacturing. Features: Breathable, liquid and particulate barrier, micro porous film laminate, and ANSI/ISEA 101-1996 sizing standard. Size Large. 25/case. 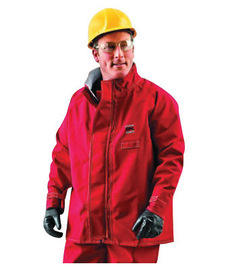 KLEENGUARD* A20 zipper front coveralls are lightweight and breathable. Strong and abrasion-resistant for extended wear. Patented MICROFORCET fabric offers barrier protection against dry particulates and light liquid sprays. Ideal for manufacturing and food processing areas. Large. White. 24 each per case. KLEENGUARD* A40 liquiduid & Particle Protection Apparel Coveralls have a zipper front and are low in lint. They pass NFPA 99 criteria for antistatic materials. White. Size 2X. 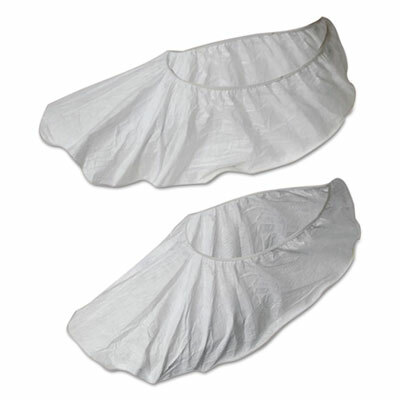 Disposable haircaps are a comfortable and complete head covering. 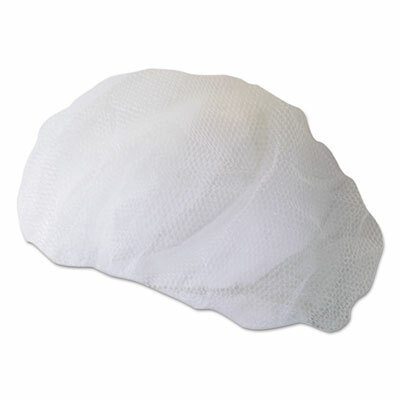 Made of a solid, soft, non-woven, lint-free fabric, the non-pleated hair cap with elastic is excellent for use in food plants, labs and pharmaceutical applications. Elastic band for secure fit. Apparel Type: Headwear; Material(s): Polypropylene; Color(s): White; Size Group: Medium. Sturdy, disposable shoe covers are constructed with tear and puncture resistant spunbond polypropylene. Elastic at the ankles for a comfortable fit. They provide particulate protection and keep out dirt and dust. These protective covers are excellent for work in dirty areas. 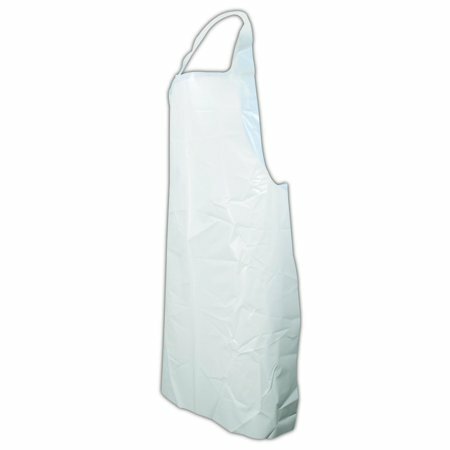 Apparel Type: Shoe Cover; Material(s): Polypropylene; Color(s): White; Size Group: X-Large. Lightweight, nylon mesh hairnets. Comfortable elastic band allows for everyday use. Great for use in foodservice. Apparel Type: Headwear; Material(s): Nylon; Color(s): White; Size Group: Large (20"). Coveralls have better liquid and particulate barrier than TYVEK�. Zipper front close makes them easy to put on and take off. Made of breathable, microporous film laminate which is low lint. Apparel Type: Coveralls; Material(s): Breathable, patented MICROFORCE* barrier SMS fabric; Color(s): White; Size Group: 3X-Large. 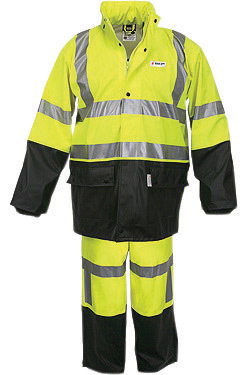 Manufactured from lightweight, spunbonded polypropylene material, these disposable long sleeve coveralls are ideal for general applications where coolness and comfort are top priority. Features serged seams and an attached elastic hood and elastic wrists and ankles. Convenient zipper front closure. 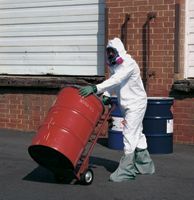 General coveralls are not liquid proof, but they are an excellent choice for dirty areas. Apparel Type: Coverall; Material(s): Polypropylene; Color(s): White; Size Group: Large.